Serving Beaverton, OR. • Aloha OR. • Hillsboro, OR • Bethany • Raleigh Hills • Murray Hills • West Portland • West Hills • Skyline areas. Here at Beaverton Gutter Cleaning we care about your family and your home. We are a local family run company. 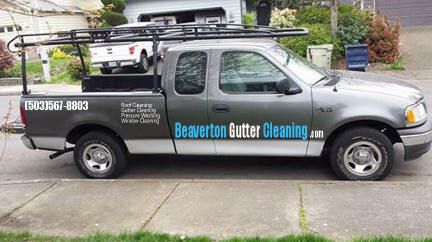 Beaverton Gutter Cleaning is licensed, insured and located in the heart of Beaverton. Gutters fill up not only with leaves, but also pine needles, roofing granules, dirt, mud, limbs and even animal and bird nests. Left untreated, this debris can cause flooding, water damage to your home, and erosion of your foundation and lawn. One of our top concerns is your pet's safety and well-being while we're on the job site. Our staff has been trained to be respectful toward not only your property, but also your family, pets and neighbors. Gutter cleaning is important, especially in Beaverton and Aloha, Oregon areas. We have many trees in the valley that can cause all types of organic debris in the form of seeds, bark, flowers, pine needles and other debris. Combine this, with dirt and asphalt that runs off of asphalt shingles and you have the perfect breeding ground for weeds and even trees to grow in your gutters, causing even extreme damage. Emmett Paul has been involved in Home Maintenance and Repair for over 20 years. From Gutter Cleaning to Roof Cleaning and Pressure Washing, Emmett has excelled in the field of home maintenance and repairs. With a high regard for ethics and moral responsibility that goes along with it, Emmett is a great choice to help with your projects.